Perfect for gift giving, homemade biscotti is easier to make than you think. Update: Every year in early December this becomes one of the most popular recipes on Farmgirl Fare. Click here for a sampling of rave reviews and signature touches from Farmgirl Fare readers. I used to be intimidated by biscotti. It always looked so elegant and so unavailable to the humble home baker. How did each piece come out looking that perfect? The entire process of making biscotti was mystifying. But when I finally worked up the courage to bake some, I discovered the most wonderful thing: there is no mystery to biscotti. It's easy to make, even on your first try. All it takes is a little time and the right recipe. Traditional Italian biscotti is not my kind of cookie. It doesn't contain butter, it's flavored with anise, and it's break-your-teeth hard because it's meant to be dunked in coffee before biting into it. My recipe, on the other hand, turns tradition on its ear. It calls for butter, produces a cookie with a nice crunch that stands up to dunking but also tastes fine on its own, and is chocolate. I love it. This dough is extremely easy to work with because it bypasses the one aspect of biscotti making that can cause difficulty, and that is all the "stuff" that's often mixed in: nuts, dried fruit, chocolate chunks, and so forth. Those tasty and attractive looking add-ins make it harder to shape the logs, and even harder to cut the biscotti into nice, even, perfect looking slices. You can, of course, stir in whatever extras you like. Just remember that I warned you. Another thing that makes this biscotti recipe an excellent choice for beginners is the fact that the dough is dark because of the chocolate, so no one will be able to tell if you overbaked your biscotti or if all of the pieces aren't the same lovely shade of golden brown. The only other thing you need to know about biscotti is that it is, by definition, a twice baked cookie, so it does take some time from start to finish. First you form the dough into 'logs' and bake them. 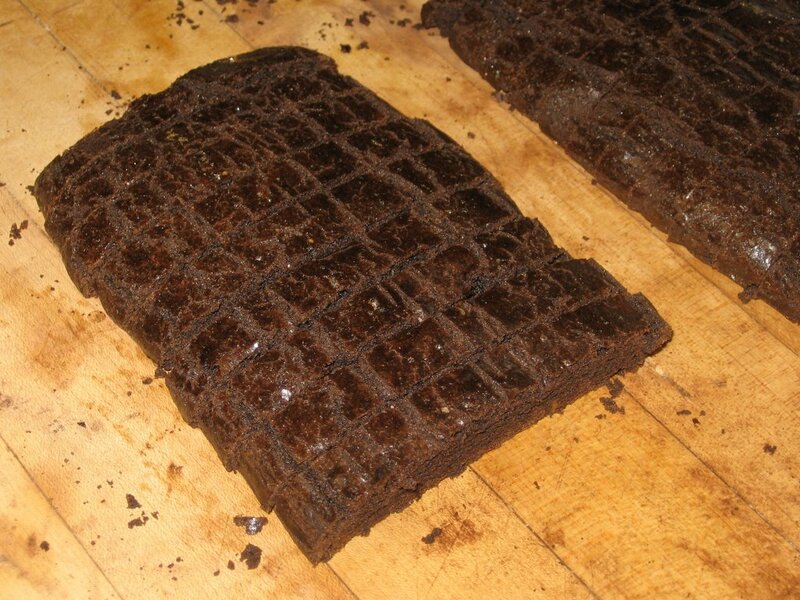 After the baked logs have cooled, you slice them up. Then you bake the slices, turning them over halfway through the baking time. I'll admit this part is kind of a hassle, but it's really not too bad. I know that some people prefer to stand the pieces up so they don't have to turn them, but if I tried that, I'm sure they would all collapse like one of those giant domino things while I was moving the baking sheet from the counter to the oven—that is if I could even get them to stand up in the first place. I find it easier to simply flip the slices over. Because it looks so perfect, and because it stays fresh for many days, homemade biscotti makes for a very nice gift. Package it in little cellophane bags tied with a colorful ribbon (I like this brand), and people will think you spent a fortune on them at a fancy bakery. Revealing the truth is, of course, up to you. I highly recommend investing in a couple of heavy duty commercial baker's half sheet pans; they're one of the best kitchen deals around. I've been using some of mine for over 20 years for everything from baking scones to roasting brussels sprouts, not to mention baking thousands of cookies. I usually line them with sheets of unbleached parchment paper, which is wonderful stuff. As always, I urge you to seek out local and organic ingredients; they really do make a difference. Organic flours are easy to find, and even organic sugar and organic cocoa powder are becoming mainstream. Adding 1 Tablespoon of instant espresso powder (I use Medaglia D'Oro) in with the dry ingredients does amazing things to this biscotti. 1. Heat the oven to 350°. Melt the butter and chocolate together (I put them in a Pyrex measuring cup and microwave them) and set aside. 2. With an electric hand mixer, beat the eggs and sugar until lightened, about two minutes. 3. Add the vanilla and chocolate mixture. 4. Mix in the flour, cocoa, baking powder, and salt just until combined. You should have a soft, but not sticky, dough. Add the extra 1/4 cup of flour if dough is too sticky. 5. Divide the dough in half. 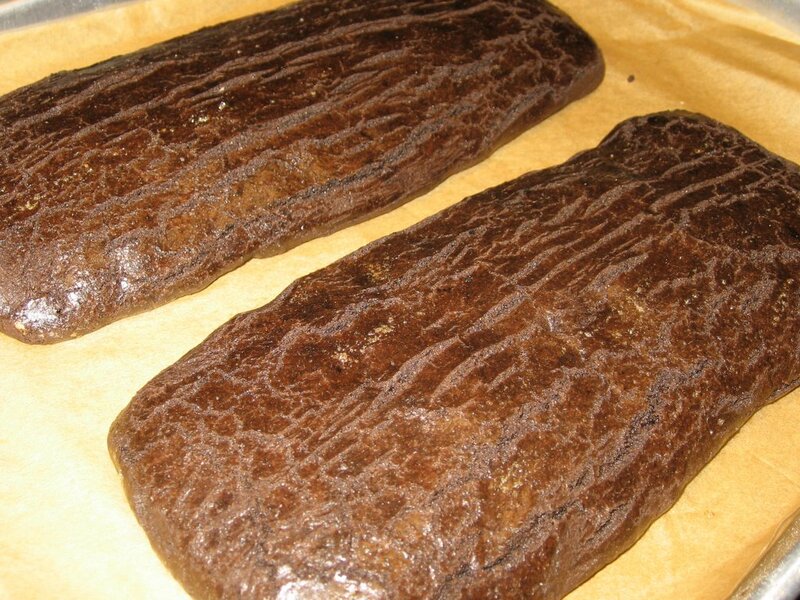 On a lightly floured surface, form each half into a log that is 3½ inches by 9 inches. Place the logs on a heavy duty baking sheet and brush with egg white if desired (I use a silicone brush). Bake for 20 to 25 minutes or until the tops are set. Update: some readers have said their loaves sliced better when cooked a little less than 25 minutes, so I've changed the directions accordingly. 6. Reduce the oven to 275°. Let the logs cool as long as you can (the cooler they are, the easier to cut), and then slice into 1/2-inch thick slices (I use my large serrated bread knife and push it through the loaves rather than 'sawing' the slices). 7. Arrange the slices on baking sheet and bake for 20 minutes. Remove from the oven, carefully turn the slices over, and bake for another 20 minutes. 8. Cool completely on a wire rack. Store in an airtight container or freeze. Can't live on sweets alone? You'll find links to all my sweet and savory Less Fuss, More Flavor recipes in the Farmgirl Fare Recipe Index. © FarmgirlFare.com, the chocoholic foodie farm blog where Farmgirl Susan shares stories & photos of her crazy country life on 240 remote Missouri acres—and there can never be too much chocolate. Oh boy, thanks Farmgirl! I'M out of cocoa, so I'll try this tomorrow. It looks terrific! Right. I am officially inspired! I once made peanut butter biscotti, which was an odd choice since I'm not a huge fan of peanut butter. I am, however, a huge fan of eating chocolate every day. It is one of my rules for life. Since drinking coffee (almost) every day is another, this could be the perfect way to bring the two together!!!!! Thanks for getting over to Modern Girls new home - it's getting there. I miss the red background though - I am working on re-building it but it's trickier than I thought. Especially for someone with NO html ability whatsoever. One's patience for trial and error lasts only so long. p.s. I am collecting "swanky holiday treat" recipes for a pre-Christmas compilation - I'd love it if you'd help spread the word! These look delicious! I'm going to go hunting for some quality ingredients tomorrow and try my hand at making them. I was just wondering, once frozen, how to defrost them so that they stay delicious and crunchy? LOL, Good morning Captain Biscotti!!! I loved this dual writeup more than the last one, I think. 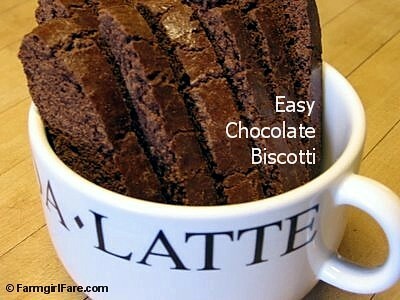 I felt the same way about biscotti--it seems so difficult and yet it's SO not! The perfect recipe, although my slices never look as uniform as yours. Both of you got good photos, too. YUMM!!! Will have to try this out when the weather is nasty outside and I have everything together. Perfect timing for your post. Every year I make a new special cookie/treat for Adam for Christmas. I been so busy I hadn't had a chance to figure out what I was going to make, but now I know what I am going to try. Thanks so very very much for posting this recipe--I'm going to try it next week after finals are over. Peanut butter biscotti? Um. . .
P.P.S. Will keep chicken retirement home offer in mind! Oh, freezing baked goods is one of the most wonderful things in the world. You can freeze practically anything--from cookies to bread to cupcakes. Just take them out of the freezer, let them defrost at room temperature (not long at all for cookies) and you'd never know they were frozen. The biscotti will come out just as delicious and crunchy as when you put it in the freezer! Glad you enjoyed reading this. But, um, I don't know if I want to be called Captain Biscotti! So easy and so yum. You'd better make a double batch for your brood! Wonderful. Can't wait to hear how much Adam loves your biscotti. I love it! Heading over to check out your biscotti now. Thanks for letting me know you were so inspired. I'm new to this blogger thing, but I love your site! A silly question, but is there a printable version of the recipe? Thanks for the baking inspiration! 1) Highlight and then "copy" it and "paste" it onto a blank page in a program like Wordpad or something on your computer. 2) Go down to the bottom of the post where it says Posted By Farmgirl at 9:18pm and click on the 9:18 part. That will give you the permalink. You can then tell your computer to "Print" and it will print out the entire post and nothing else from my blog. WoW, that was fast. Thanks for the quick response! It's VERY cold and snowing here in PA, great day to bake! Wonderful! I made these yesterday. Easy and yummy! So, I have a tried and true biscotti recipe; I'm good there. What I want to know is this: where did you get the jumbo mug? Matt and I have been searching everywhere for those giant, Friends-like latte mugs, to no avail! So glad you had biscotti success! I found these mugs last year at (Cost Plus) World Market. I adore them and am still wondering why I only bought two. They are huge! We had these very chocolate biscotti last night, made by Farmgirl Susan herself. These are the best damned things in the world. XO and thank you for Christmas Cheer, my farmy friend. Just found your site while figuring out how to keep my biscotti from cracking on top while baking! I think it's an impossibility, but I am so happy to have found your site. hi farmgirl, it's my first time popping in here..your photo was next to mine in spittoon extra. Anyways, this chocolate biscotti does seem easier to make than one would think. Thanks for the inspiration. Hmm--I've got a batch of these baking right now, and they are REALLY fragile and crumbly. Many of them broke as I was flipping them (I was gentle, really!) for the second baking; others broke as I was slicing the "loaves." My dough was very sticky, so I did add the extra 1/4 cup of flour. Would baking the "loaves" a little too long cause the crumbly problem? They seemed fine but my oven runs a little hot. Any help appreciated! You're welcome. And welcome to the farm! Oh no. What sad news about your biscotti. I'm sorry you're having such trouble with it. As you can see, there has been quite a bit of success with the recipe, so I hope you don't give up on it. Unfortunately, I can't figure out why you're having such problems. I've emailed my biscotti baking pal, Clare, for help but haven't heard back yet (it's night time in Australia). Maybe your dough was still too soft. It shouldn't stick to your fingers while you're shaping the loaves. Or, as you mentioned your oven runs a little hot, the first bake might have made them a bit too hard--so when you sliced them they tended to break apart becuase they were already crunchy. But breaking them just when you're flipping them over--I'm stumped. When you say "crumbly," do you mean they are hard and breaking apart into crumbles--or is it that the cookies are more on the soft side and literally falling apart? I'll keep thinking and get back to you if I come up with any other ideas. Anybody else have any suggestions? Made these last nite - and we couldn't stop nibbling on them as soon as they came out of the oven - YUUUUUUM! 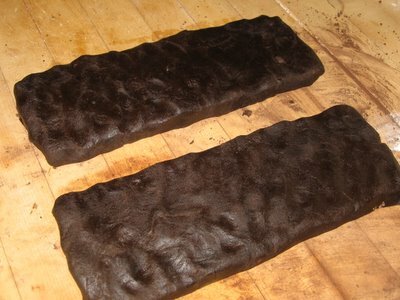 I used Hershey's new Special Dark Dutch Processed cocoa, and they turned out REALLY dark. Kinda look like pumpernickle? Thanks for the great recipe! i have biscotti in the oven right now as a matter of fact (Chocolate Nightmare Biscotti). i make biscotti at work and that recipe (also mine) is REALLY sticky but i've found that if you keep your hands wet at all times and slick the top with water before putting them in the oven, the tops won't crack. mine haven't cracked in almost a year. i'm sorry if you already mentioned this, i didn't read this entry in its entirety. Your recipe was wonderful and easy! all the ladies at my pampered chef party loved it, and were surprised I had made it myself! I finished mine off by dipping one end of the biscotti in chocolate!! I just made these and oh.my.gosh. I can't wait to bring them to thanksgiving dinner tomorrow. They are SO rich. I used ghirardelli bittersweet chocolate chips which are very dark. I also melted another half cup of the chips, dipped one end of each biscotti in it, and sprinkled shredded coconut on top to dress them up a bit for the holiday. Regarding the crumbling issue -- I was short on time so I used a big sharp French knife to slice through them while they were still hot. If you're careful you can do it. This is my first visit to this site and I'll definitely be back! I stumbled across this recipe a few weeks ago. My Mom always made great chocolate biscotti, but she hasn't made any for a while, and I had a hankerin'! I made 2 batches two weeks ago, and am making 2 batches tonight for our family Christmas get-together tomorrow. It's awesome stuff! I used a full cup of Nestle's Baker's Choice 62% cocoa chips in each batch to drive home the dark chocolate theme. The cookies didn't turn out ultra-cripsy, but were still plenty hard like the biscotti I remembered. I recommend baking the sliced cookies a tad longer than stated. great stuff! Thank you Farmgirl! I'm sorry. Upon further pondering, I did use the prescribed amount of chocolate chips - 2/3 cup, not 1 full cup. I did bake my sliced pieces for about 25 minutes per side. After tonight's batches, I shall seek an even higher cocoa content chocolate to try with this recipe. Thanks again farmgirl! I am thinking of making one large loaf that will create the loooong biscotti seen in the coffee shops and bakeries. I will make my loaf 9 inches long but will be 7 inches wide and then they will be nice and long...what do you think? I made a double batch of these and brought them to my family's pre-christmas party and they were a big hit. my advice about the crumbling thing is to bake them just a couple minutes less the first time around so they're still a little moist. Very, very yummy. I find it difficult to bake it enough the second time around. Biscotti needs to not be soft in the middle but not so hard that your teeth fall out. Advice? Hi !! I actually loved you chocolate biscotti. Ha! I'm finally trying it! They are baking right now and smell OOOOHHH so good! My almost 3 year old and I mixed it all together and then couldn't stop licking the bowl! I hope it turns out being my first try! I want to try to make these. I have peanut butter chips (can I substitute?) also, I have whole wheat flour ... will that work as well as all-purpose white flour? Thanks! Were going to attempt and try to bake these in Zambia, but we do not have any chocolate, could you send some over? Just made the biscotti and they are a dream! I did add dried cherries and chocolate chips and found it didn't affect the slicing. Mmmmm! Thanks! Thanks so much for the recipe! My son told me tonight at 8pm that he wanted to give gifts to all 9 of his middle school teachers... tomorrow. Can I get an "oy!" They're on my momblog. Thanks again. You're a lifesaver! Happy Holidays, all! Here's a photo ! I'm going to call them "teacher's little helper." lol Thanks again! I'm currently making them at the moment. I used Splenda instead of sugar and used Ghirardelli 60% cacao dark chocolate and a few of the cinnamon spiced almond squares to make the 4 ounces. They smell wonderful so far. i have made this recipe a few times (thanks! ), and last night, i made them with mint chocolate chips. yum! I am not a great baker, but I am really glad I tried your recipe. They were great, even better than store bought! I always thought biscotti was so expensive, so I am happy I can make my own now : ) Thanks for the recipe! it has been awhile since i've made this recipe, and i am now dairy-free by necessity.is there any way to make this dairy free? why do the slices break in half when i caut the loaves before i return them to the oven for extra drying? Try letting the loaves cool longer before slicing into them. You might try a different knife, too. I use a large serrated knife and push it through the loaves rather than 'sawing' the slices. Sooooooo!!! I discovered your blog from another blog, and have always wanted to try making biscotti, but was always worried it was too hard. WELL ... not feeling good today, but was bored, so I decided to go slow ... and do it. Right now, the logs are cooling ... those are the photos you can see now. Of course, I've been waiting ALL my life, to cut into them fresh from the oven and eat, so you'll see 3 small slices cut and I ate them up ... oh my, what delicious chocolate cookies! I made this biscotti for holiday gifts. Have made two batches so far. Absolutely yummy! Thanks. Thank you SO much for this recipe! Quick question for you... After you reduce the oven temp to 275, how much longer should I bake at that temp? Reduce oven to 275 degrees. Let logs cool as long as you can (the cooler they are, the easier to cut), and then slice into 1/2-inch thick slices. Arrange the slices on baking sheet and bake for 20 minutes. Remove from oven, carefully turn slices over, and bake for another 20 minutes. Cool on a wire rack. Store in an airtight container or freeze. WOW - This biscotti recipe looks like one I would love. Smart idea to add the butter. Thanks for sharing. I just made this biscotti and it turned out beautifully, Thank You for a perfect recipe!!! I drizzled chocolate over them and sprinkeled christmas sprinkles and walnuts on them and packaged them to give as gifts. When I make biscotti, so I don't have to do the turn over, I put them on a wire rack and then put the wire rack on top of a cookie tray. It raises them up and allows the baking to be all over rather than on just one side. I make all kinds, but I do love the anise italian kind. Though I don't make them break your teeth hard. One question regarding the egg white wash. What benefit doe it have. Does it help to keep the log together when cutting? And, another question ... which knife works best and what technique do you use to cut whole biscotti? I always end up with quite a few "rejects" .. great for us but not so good for gift giving. As for cutting the whole baked logs into slices, I use a really big serrated knife, and I press the knife into the logs more than 'sawing' the slices, if that makes sense. That said, I do always get a few reject pieces that break. I usually just gobble them up in the name of taste testing, but they're also really good sprinkled over ice cream. Very nice flavor and perfect for having with an espresso. Thanks. I just had to tell you that I LOVE this recipe. I make it all the time. I made some for Christmas using mint and dark chocolate chips- amazing! They were a great handmade gift for my son's teachers! I was craving biscotti after seeing Giada de Laurentis make some on tv and came across your blog. oh my goodness. these are AMAZING!!! i coated half of it in white chocolate and eat them plain (i hate coffee). i usually don't eat chocolate but this is worth it!! thanks for the recipe!! They are very sweet and very chocolaty! I added some almonds for a true Italian twist! 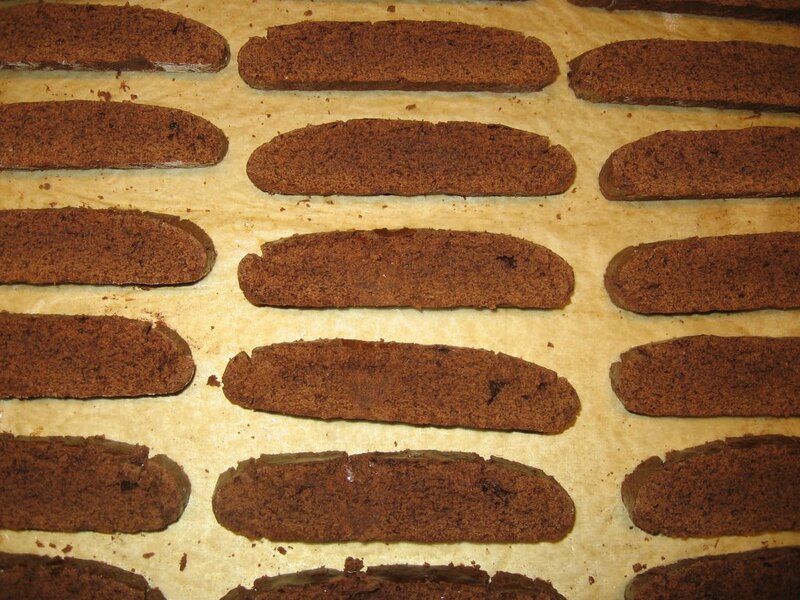 My European friends call the chocolate biscotti American biscotti because they wouldn't dream of making biscotti with chocolate. I made them for my friend Lucie. I am sure she will appreciate. As for myself, I will stick to my anise, almond and mixed candied citrus. I also never add butter or oil! Thank you for the recipe. I am going to link this site to my biscotti picture in fb. I had to used white chocolate and just use a larger heap of cocoa powder since I couldn't find dark chocolate when I couldn't wait to try this recipe. First time out of the oven, it tasted like a good brownie and after baking it the second time it was the right biscotti. My 1 year old gobble a piece in a few minutes. Thank you again. I decided to try this recipe for my first time making biscotti. I am very glad that I did they are delicious. I had no troubles at all thanks to your clear instructions & pictures. I topped them with a white chocolate drizzle. they will make a very tasty addition to my christmas goody gift baskets. I will certainly be using this recipe again. Thanks & Happy Holidays. I make these every year. They are ALWAYS a huge hit. Even those who don't like dunking them in coffee love them with milk or even tea. Or just naked! They are soooooo delish. Love your recipes!